original art piece created in “your turn” workshop. Join us Friday, August 4 at 5pm in celebrating collaborative art pieces created in our two “your turn” workshops! 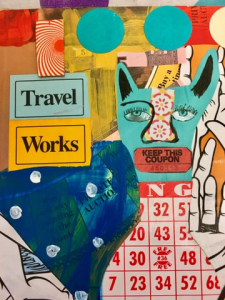 This opening reception will feature original artwork created with game boards and a mix of other recycled materials and traditional art-making techniques. Jacinta Bunnell and Cindy Hoose, two Hudson Valley-based artists who have been collaborating for over a decade on various artistic projects, led the two workshops with a spirit of play and adventure. Participants took turns, chances, developed trust, and learned to make art without judgment. Work from Bunnell and Hoose’s “your turn, dear” will also be on display. The reception will be in the community room of the library, which is wheelchair accessible. The exhibit will be up through Labor Day in the community room of the library. This program is made possible with public funds from the Decentralization Program of the NYS Council on the Arts, administered in Columbia County by the Greene County Council on the Arts through the Community Arts Grants Fund. This entry was posted in Adults, Children, Programs, Young Adults by Brenda Shufelt. Bookmark the permalink.